Trauma has been a huge factor in how our young people react to people and situations, how they assess their lived realities and respond to those who have input into their lives. They often don't trust people and have difficulties building impactful relationships. We have developed the five pillars of support: Collaboration, Inspiration, Listening, Comforting and Celebrating all their relationships! This year we have employed a parent liaison worker who role it is to support parents and to better coordinate and community with the family unit. Karen has been supporting parents providing training, Learning Dreams and self-help through parent supporting meetings. If you are a parent and need help in anyway please give Karen a ring at the youth centre. Ambassadors for Peace is a community relations programme with young people from Shankill, Tigers Bay, Holy Family and St. Peters. 40 are funded through TBUC to operate a year long programme of activities, training, seminars and residential activities. Last year the group created a documentary and set of recommendations to remove the peace walls in the Lower Falls. and Shankill communities. This year the programme will begin in June 2018. New have a small outreach team who work on the Streets Monday to Friday nights. The team have various routes that they take daily. The role of the staff is to engage young people not presently attending youth provision or who are at risk of become involved in self-harming or anti-social behaviours. If you see them out and about ask for a card and come see what we can offer you. Enabling young people to bolster their CV is very important. We provide a number of accredited and non-accredited programmes within the youth centre. We work to the Education Authorities Outcomes Framework and report to these. In the last year we have over 300 accreditations completed with our young members. With a growing team it is essential that we develop a set of skills, knowledge and techniques within the community that helps improve the service delivery to our young people. 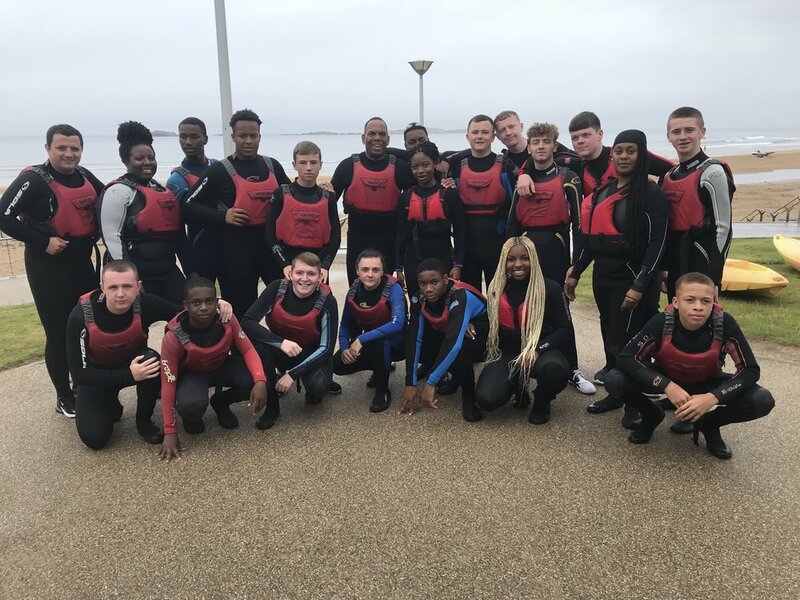 Over the year we have developed a suits of training, conferences, study visits and symposiums that build the knowledge, skills and talents of youth workers not just within Lower Falls but also across the country. We have led the way in promoting Circle of Courage, Responsibility Pathways, Trauma Informed Practice, ACE's and much more. We are seeking to create a team of youth workers who better understand the needs of the young people and can help support them as they grow into responsible citizens. Young people from Belfast and Pittsburgh worked together over the summer of 2018 to examine, compare and contrast their experiences of Global issues including power, prejudice and discrimination. The young people undertook a number of seminars, some accredited training and developed a video documentary of the week. Many thanks to ALPS, Corrymeela and Amizade for making this happen. The START programme is a partnership programme with young people aged 11-25 yrs of age from West Belfast who are deemed to be at risk due to their lifestyle, behaviours and vulnerabilities. The project will work with a small number of very vulnerable young people and help them create pathways to education and employment using personal and social development. Young people aged 14-17 years of age are taking part in a year long programme of training, personal development and social action in the Divis community. The 12 young people will volunteer locally and effect positive change to their own community. With the support of Amizade International we host students and send young people to the United States. The aim of the programme is to provide young people with a sense of belonging and responsibility to their own community. This year we have 12 young people both male and female taking part. TREKS is a new initiative supporting young people aged 16-25 years of age with the skills and potential for securing employment. Funded by the International Fund for Ireland we have tow dedicated staff (Liam & Ivan) who sole job it is to help you get work. We are offering courses, training, study visits, workshops, driving theory, driving lessons and much more. If you are 16-25 yrs of age call in for a yarn. We operate a drop-in facility every day Monday to Friday from 9am-3pm and have a cuppa and a yarn.